The angled view configuration APO Televid 65mm Spotting Scope from Leica combines premium optical elements with a weather sealed housing and a proprietary micro-focusing system. Four fully multicoated apochromatic lens elements and a Schmidt prism system form the core of this optical instrument. Leica's fluoride apochromatic glass is engineered to transmit luminous images that are geometrically flat from center to edge and color-faithful across the entire visible spectrum. When paired with Leica's 25-50x wide angle aspherical zoom eyepiece (separate purchase required), the APO Televid renders high contrast images that are rich with detail. A magnesium-alloy chassis makes the structure of the APO Televid as rigid and durable as aluminum chassis-designs in the same class but significantly less heavy than those models. To deliver weatherproof performance, the optical channel is nitrogen filled and o-ring sealed, maintaining its watertight seal to a depth of five meters. The AquaDura-coated hydrophobic objective lens surface resists moisture accumulation by causing rain and condensation to bead up and roll off the lens surface. The rubber armored body is shock-absorbent and slip-resistant, providing an additional layer of protection against the unexpected. Leica's proprietary internal dual-focusing system enables the operator to control the focus of their scope with coarse or fine movements, ideal for digiscoping and nature observation. 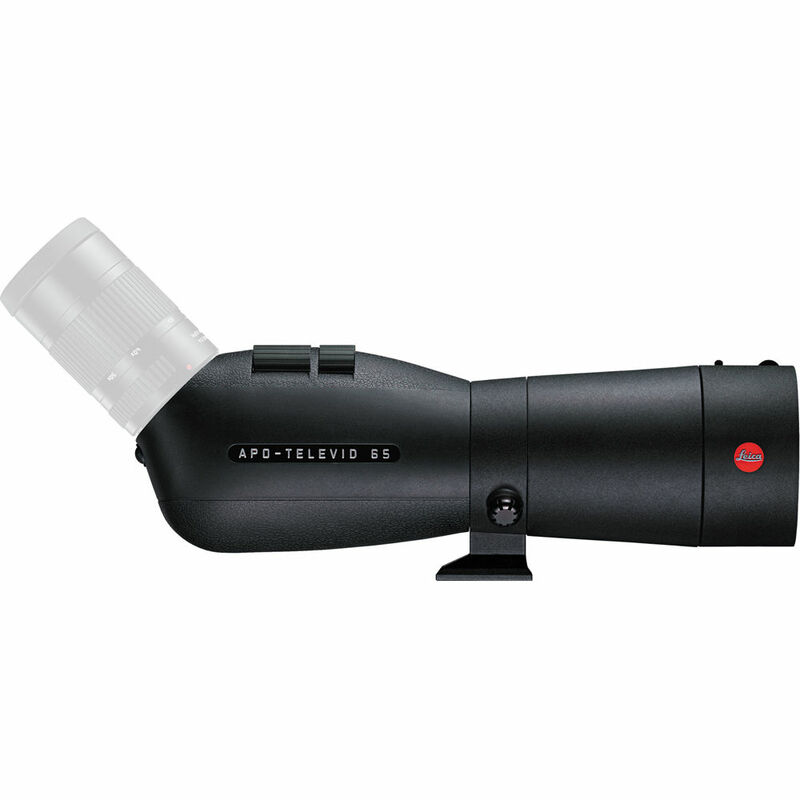 The integrated rotating tripod collar, quick-change bayonet eyepiece mount, and sliding lens hood make the APO Televid a full-featured spotting scope for a wide range of recreational and professional glassing applications. Box Dimensions (LxWxH) 14.5 x 5.8 x 5.2"